The roster application maintains the team rosters for players in recreational sports leagues. The application has four components: Java Persistence API entities (Player, Team, and League), a stateful session bean (RequestBean), an application client (RosterClient), and three helper classes (PlayerDetails, TeamDetails, and LeagueDetails). Functionally, roster is similar to the order application, with three new features that order does not have: many-to-many relationships, entity inheritance, and automatic table creation at deployment time. 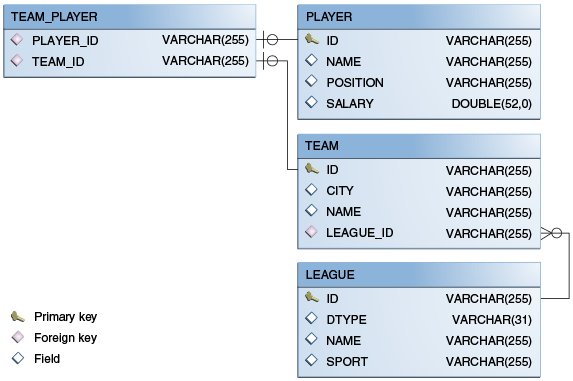 The database schema in Apache Derby for the roster application is shown in Figure 41-2. In this diagram, for simplicity, the PERSISTENCE_ROSTER_ prefix is omitted from the table names. A recreational sports system has the following relationships. A player can be on many teams. A team can have many players. A team is in exactly one league. A league has many teams. In roster this system is reflected by the following relationships between the Player, Team, and League entities. There is a many-to-many relationship between Player and Team. There is a many-to-one relationship between Team and League. The @JoinTable annotation is used to specify a database table that will associate player IDs with team IDs. The entity that specifies the @JoinTable is the owner of the relationship, so the Team entity is the owner of the relationship with the Player entity. Because roster uses automatic table creation at deployment time, the container will create a join table named PERSISTENCE_ROSTER_TEAM_PLAYER. Player is the inverse, or nonowning, side of the relationship with Team. As one-to-one and many-to-one relationships, the nonowning side is marked by the mappedBy element in the relationship annotation. Because the relationship between Player and Team is bidirectional, the choice of which entity is the owner of the relationship is arbitrary. The roster application shows how to use entity inheritance, as described in Entity Inheritance. The roster application uses Criteria API queries, as opposed to the JPQL queries used in order. Criteria queries are Java programming language, typesafe queries defined in the business tier of roster, in the RequestBean stateful session bean. Metamodel classes model an entity’s attributes and are used by Criteria queries to navigate to an entity’s attributes. Each entity class in roster has a corresponding metamodel class, generated at compile time, with the same package name as the entity and appended with an underscore character (_). For example, the roster.entity.Player entity has a corresponding metamodel class, roster.entity.Player_. The EntityManager instance is injected at runtime, and then that EntityManager object is used to create the CriteriaBuilder instance by calling getCriteriaBuilder. The CriteriaBuilder instance is created in a @PostConstruct method to ensure that the EntityManager instance has been injected by the enterprise bean container. A query object is created by calling the CriteriaBuilder object’s createQuery method, with the type set to Player because the query will return a list of players. The query root, the base entity from which the query will navigate to find the entity’s attributes and related entities, is created by calling the from method of the query object. This sets the FROM clause of the query. The WHERE clause, set by calling the where method on the query object, restricts the results of the query according to the conditions of an expression. The CriteriaBuilder.equal method compares the two expressions. In getPlayersByPosition, the position attribute of the Player_ metamodel class, accessed by calling the get method of the query root, is compared to the position parameter passed to getPlayersByPosition. The SELECT clause of the query is set by calling the select method of the query object. The query will return Player entities, so the query root object is passed as a parameter to select. The query object is prepared for execution by calling EntityManager.createQuery, which returns a TypedQuery<T> object with the type of the query, in this case Player. This typed query object is used to execute the query, which occurs when the getResultList method is called, and a List<Player> collection is returned. You can use either NetBeans IDE or Maven to build, package, deploy, and run the roster application. If the database server is not already running, start it by following the instructions in Starting and Stopping Apache Derby. Select the Open Required Projects check box. In the Projects tab, right-click the roster project and select Build. This will compile, package, and deploy the EAR to GlassFish Server. This compiles the source files and packages the application into an EAR file located at tut-install`/examples/persistence/roster/target/roster.ear`. The EAR file is then deployed to GlassFish Server. GlassFish Server will then drop and create the database tables during deployment, as specified in persistence.xml. After successfully deploying the EAR, the client stubs are retrieved and the application client is run using the appclient application included with GlassFish Server. [echo] running application client container.